There are cries of "I'm bored!" "What can we do now?" and the one that gives me chills..."can we get the craft box out?" Everything happens in minutes and lasts seconds! By 8.30am we've often exhausted all options. It's days like this that I break out my secret weapon play. It's water play but...it last ages, the kids think they are on to a winner and I get some jobs done...by then! Let me introduce you to my washing up session. I give them a bowl of washing up bubbles, some sponges and bits that need cleaning...and then let them free. 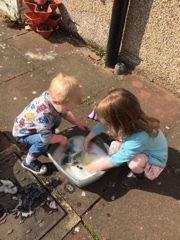 Sometimes I even let them wash the toys that have been left out in the garden...I know...super mum eh! The best bit is that this keeps them busy for about 20 minutes, they have fun and I get to sit down with a coffee and watch and take photos of them in the process.